One of my New Year’s Resolutions is to keep a good photographic record of my vegetable garden, fruit-growing and yard this year. My plan is to photograph my yard around mid-month so I can keep better track of what grows and blooms when. Since my raised beds are new, I’m still getting used to them. These pics were taken Jan. 26. Raised bed #1 has bell peppers that I planted in spring of 2009. They are not only still producing peppers, they’re showing flower buds for the 2010 season! 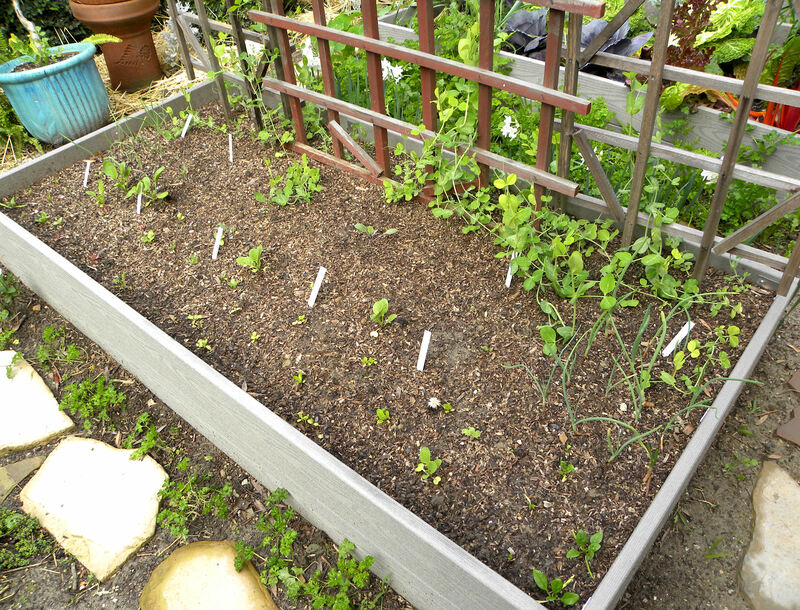 Also in this bed are two tomatoes, a zucchini, and a square foot each of garlic, mizuna, arugula, hollow crown parsnips, Danvers half-long carrots, Lucullus chard, and red sails lettuce. In the background, I have a blueberry bush, Asian pear, Meyer lemon, navel orange, and a teepee of snow peas. Aristocrat zucchini, a total experiment. I don't usually grow zucchini, preferring Patty Pan and yellow summer squash, but I thought I'd try a winter zucchini for the first time. 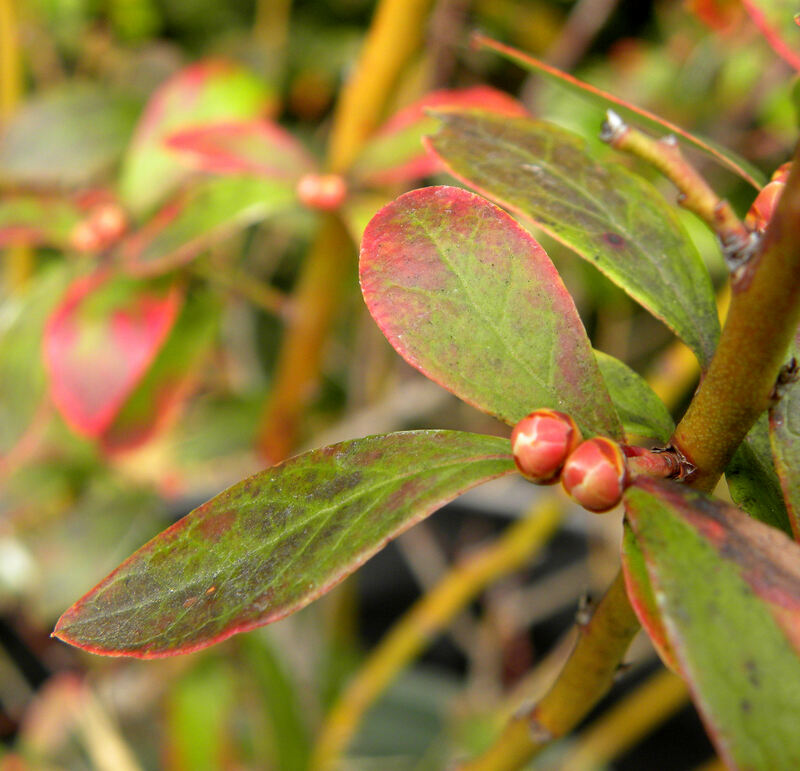 Oh boy, flower buds on my blueberry bushes! I can hardly wait for blueberries. I harvested them over a two-month period last spring. The cauliflower is gone (YUM!) from raised bed #2. Ditto the spinach. Most of the lettuce is gone as well. I’ve replanted the empty spots with garlic and broccoli. The broccoli plants are heading up while the plants are tiny, so I think that crop will be pretty much a bust. My first leeks are ready to harvest though. I started them from seed last January. Amazingly slow, just like my savoy cabbage, which is also taking a year from seed to harvest. My rainbow chard has been producing steadily ever since I put the transplants in back in late Sept. Win some, lose some. Raised bed #3, planted in October from seeds. Poor raised bed #3. 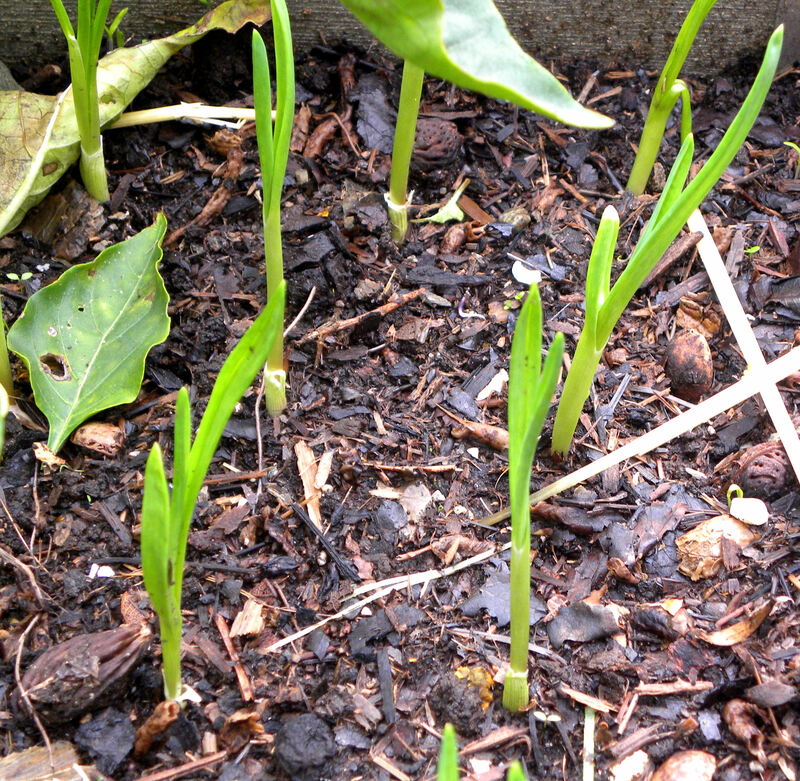 It has gotten less than three hours of sun a day since October, and the poor little seedlings are just languishing. In this bed I have sugar snap peas, red onions, yellow onions, lettuce (Black-seeded Simpson and Lollo Rossa), cheddar cauliflower, spinach, and mizuna. The sun has been moving north since the winter solstice a month ago, and the seedlings are finally showing some signs of growth. I expect better results from this bed in summer. My Garden of Infinite Neglect by the front sidewalk. Boy, does this area need some attention. The Garden of Infinite Neglect has kale still growing from a planting of dwarf Scotch blue curled kale in 2007. The new leaves are just as tasty and tender as newly planted kale. Amazing plants. I have collards ready to harvest as well. Those plants also went in a year ago. I pick some of them about every two months for collard greens and a ham hock or bean soup. I planted these poor savoy cabbages from seed a year ago. They’re just now heading up. None are ready to pick yet. 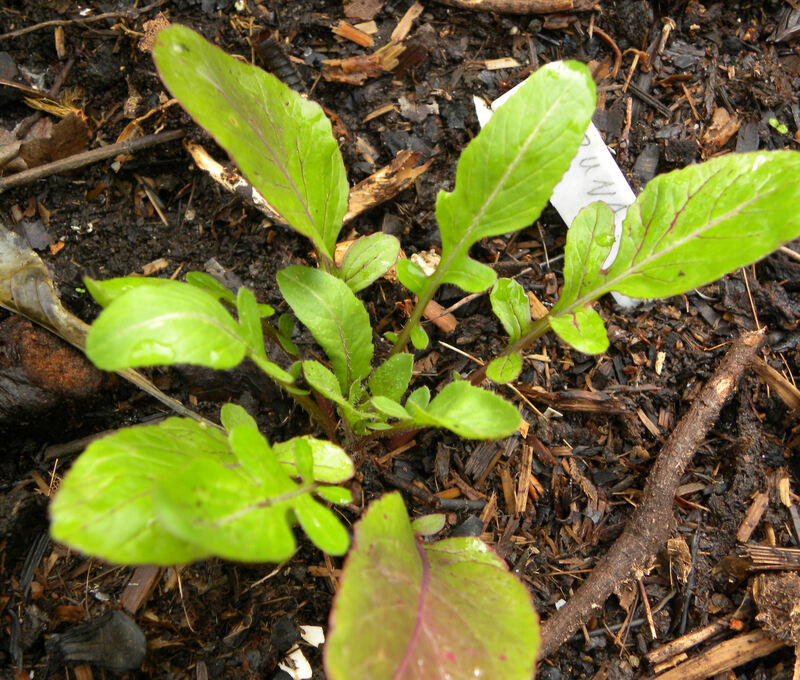 And somewhere in there is a patch of Lutz Greenleaf beets that I never got around to pulling, also a year old. This poor area got seriously neglected while I was working on my backyard makeover with new raised beds and resetting the pavers. Speaking of neglect, here is my Garden of Perpetual Responsibility. Somewhere between the weeds, I have eight artichoke plants and about 30 red onions. The storms broke one of the trellises for my thornless blackberries, so that’s one more chore that needs doing in this area. 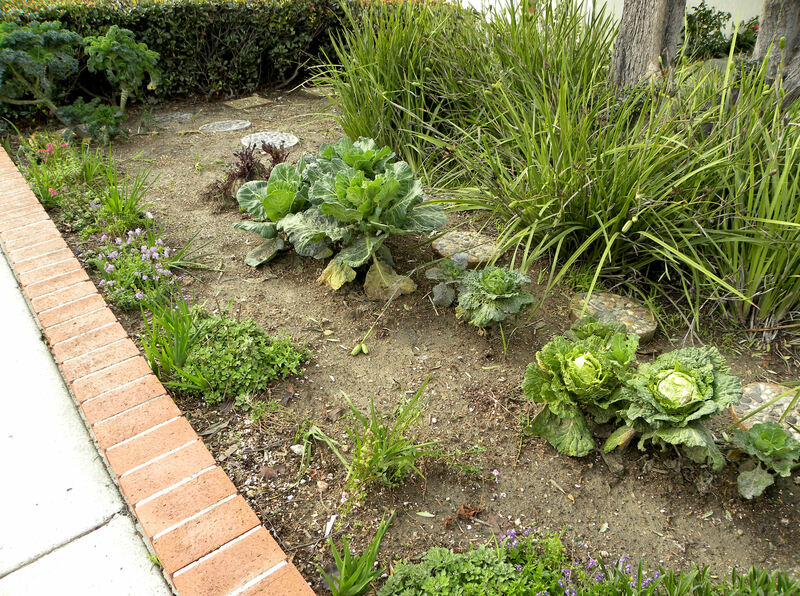 These two gardens should make you feel good about your own gardening efforts. I’m sure you don’t let weeds grow in your garden. 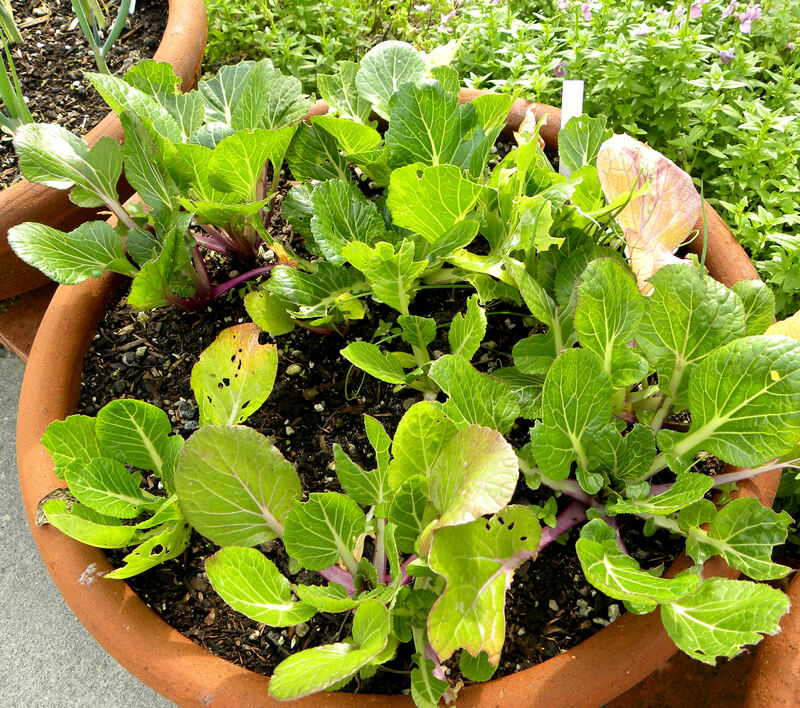 I also grow baby bok choy in bowls during the cooler months. I think I'll eat a few of these for dinner. 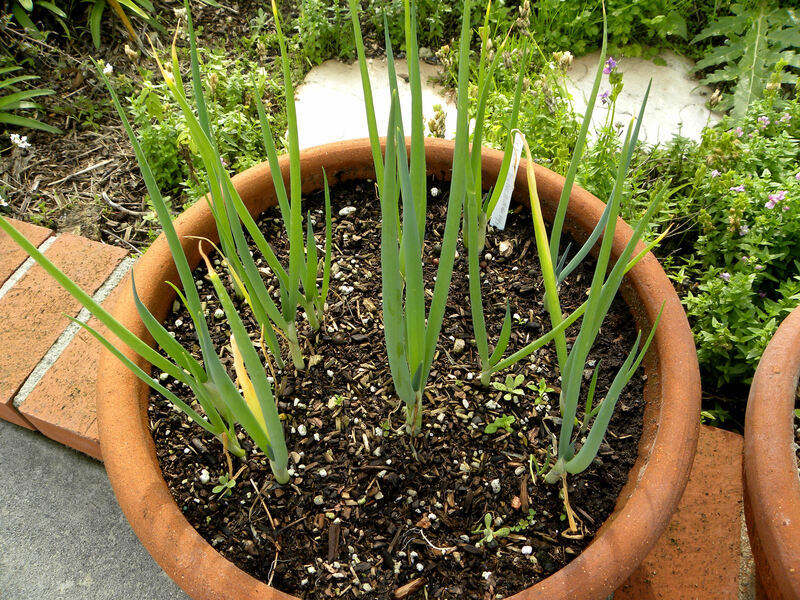 I grow green onions in bowls, starting a new batch from seed every few months. With two bowls of green (bunching) onions growing constantly, I haven’t had to buy them from the store in over a year. 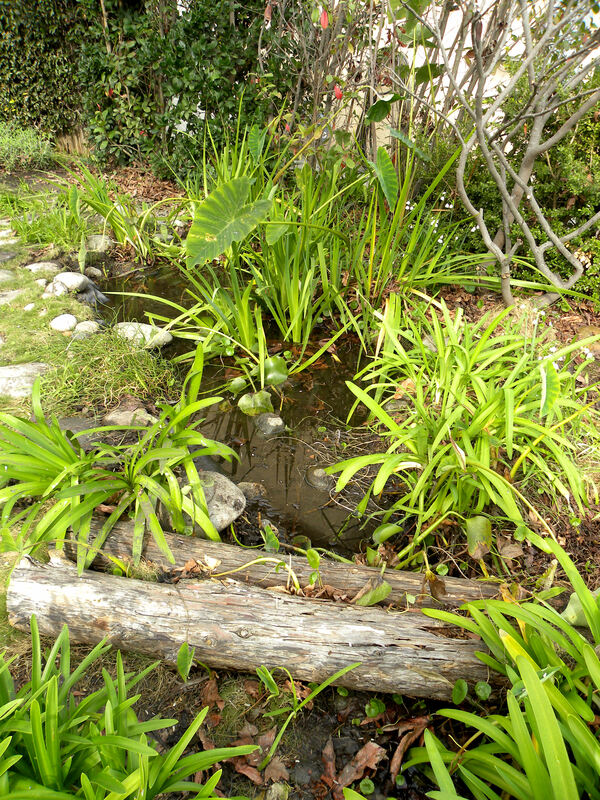 Pond in our front yard that I built myself about 10 years ago. One of my recent projects is battling ecological succession in my front yard pond. I constructed this pond myself about 10 years ago, digging the hole, lining it with a felt blanket and thick rubber pond liner, adding rocks, then planting it with taro (elephant ear), water iris, water hyacinth, wiry rush, dwarf rush, and pennywort (big mistake–it has spread outside the pond and all over the yard). But over time, the plants grew and leaves fell in and decayed. What had been an 18″ deep pond had only a skim of water in it, with a deep, soggy layer of debris going down almost all of those 18 inches. The mosquito fish were running out of room to swim. So after all of our recent rain, I thinned out the plants and mucked out some of the debris. More work remains to be done, but it’s looking better. 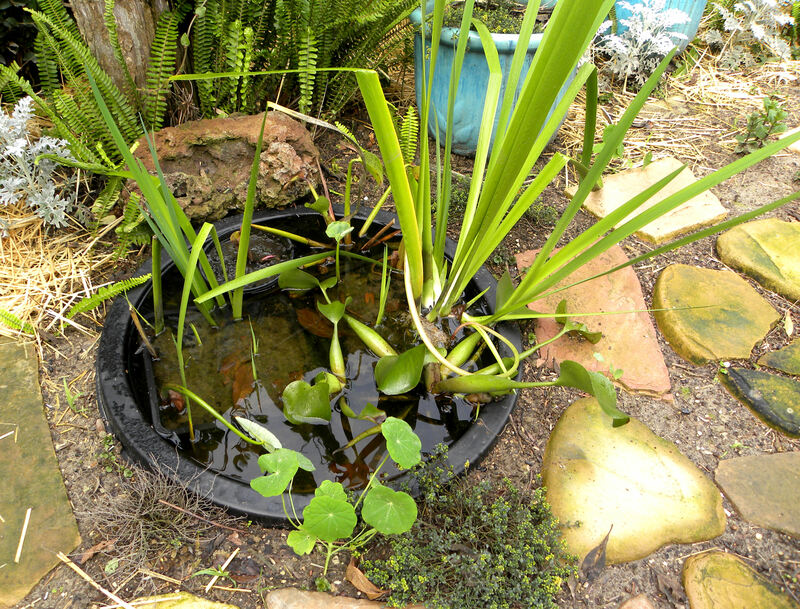 My backyard pond is a simple pond liner set in the ground and filled with plants and gravel. It's more of a water garden than a functional pond, but it provides water year-round for birds, insects and other wildlife in back. I set this up in October, so it's a new pond. Our yard is a certified National Wildlife Federation backyard habitat, but most of the wild habitat now is in the front yard since the back got converted to veggies and fruit. To be certified and/or to attract birds, insects, and other wildlife, all you need is food, water, and cover. Using plants native to the area in your landscaping is a bonus. But that’s topic for another post. This entry was posted in Uncategorized and tagged artichokes, bell peppers, cauliflower, chard, garden, photos, pond, raised beds, vegetable garden, vegetables, water garden. Bookmark the permalink. 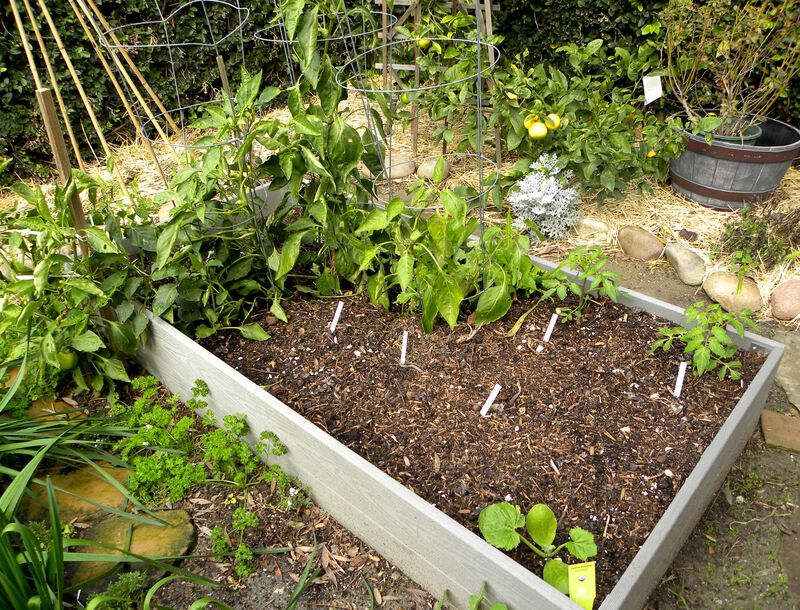 It’s easy to see why raised bed #2 is your favorite … it is beautiful! Thanks, Pamela. I’m enjoying watching spring unfold in your English Cottage Garden in Pennsylvania’s Poconos. Hey Lou, looks delicious and like work. You’ve accomplished a lot. Hi Anna (flowergardengirl), thanks for stopping by. 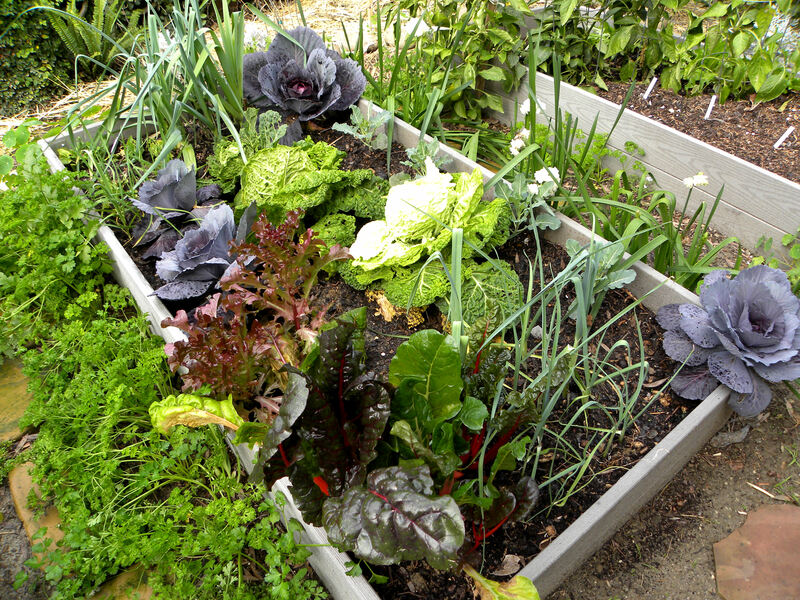 Your plans for a new organic veggie garden sound exciting and I love watching your little Coppertop Cottage take shape on your blog. Your raised bed no.2 is also my favorite! Those chard leaves are huge! I can never get them to grow this large. And I have heard that as they grow they develop better taste. Hi Vrtlaricaana, I’m not sure that the taste of my chard changes with size, but the texture sure does. 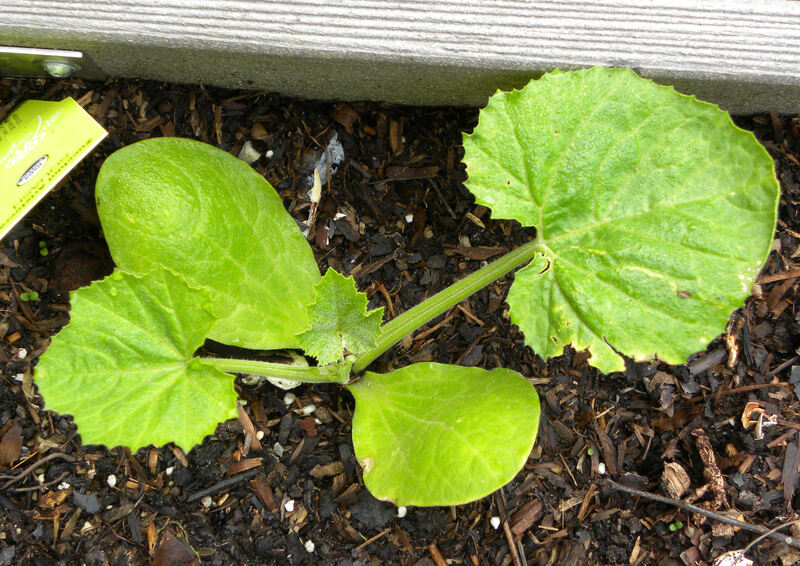 The large leaves have a lot of “texture.” I think I prefer the young, tender leaves, but if I wait to harvest them, I get more vegetable. I go for more! my little organic veggie garden isn’t looking so great. (weak soil) fun to see what one that is thriving looks like!! Laguna, good luck for your garden this year. such a beautiful garden and wonderful detail in the close up photos. 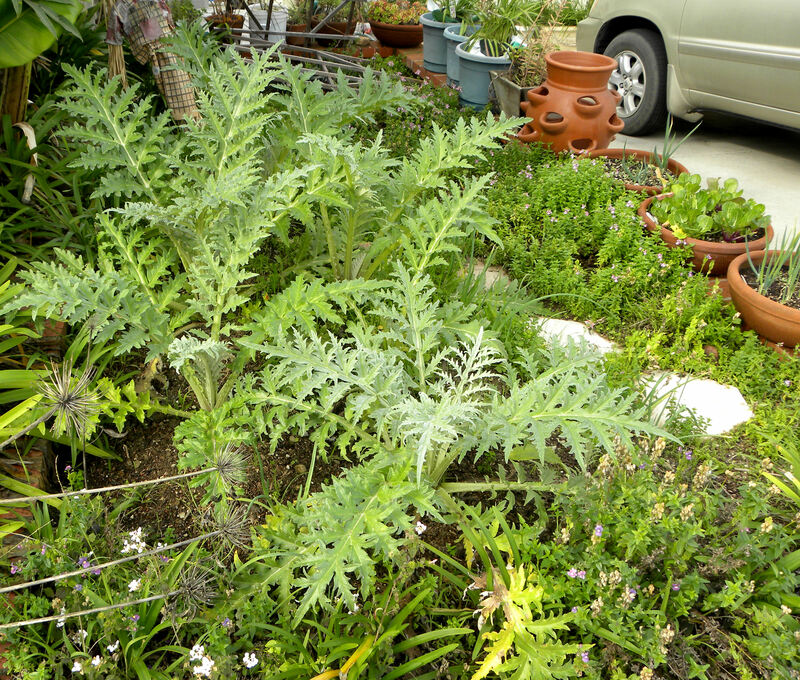 i really want to grow artichokes next season, i just love the way they look and bloom. this company down to earth lawn and garden service in orange county does veggie gardens for anyone who needs help getting started, check them out: downtoearthlgs.com in their portfolio they’ve got some awesome veggie shots and a glimpse at a few boxes .